Before we left Edinburgh for Belfast, the main thing everyone would tell us, who had visited before, was just how green everything is. Although I can’t deny, that is true - in part due to the amount of rain! 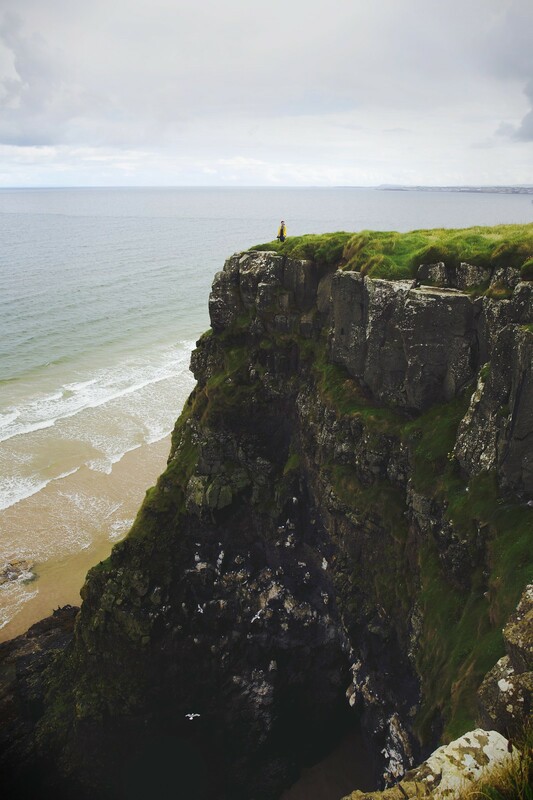 What they failed to mention was just how beautiful the coast of Northern Ireland is. 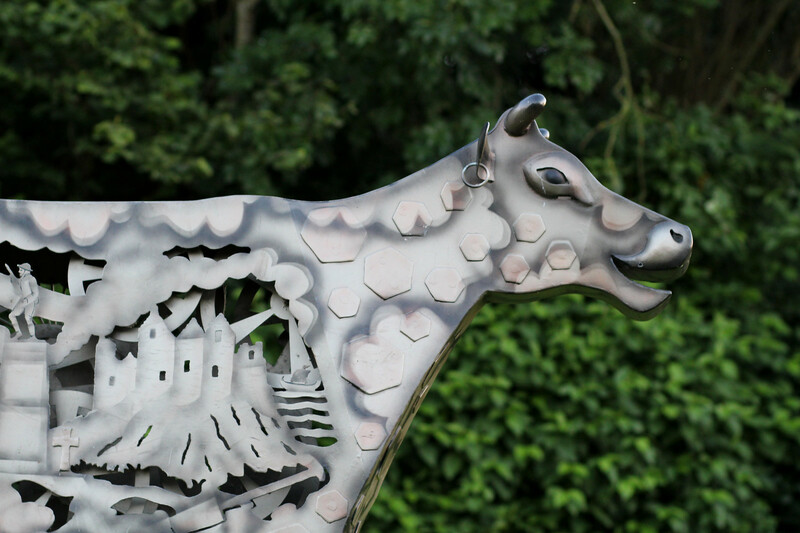 On every corner you’ll be greeted by a new cliff face or beach, with ever changing views. 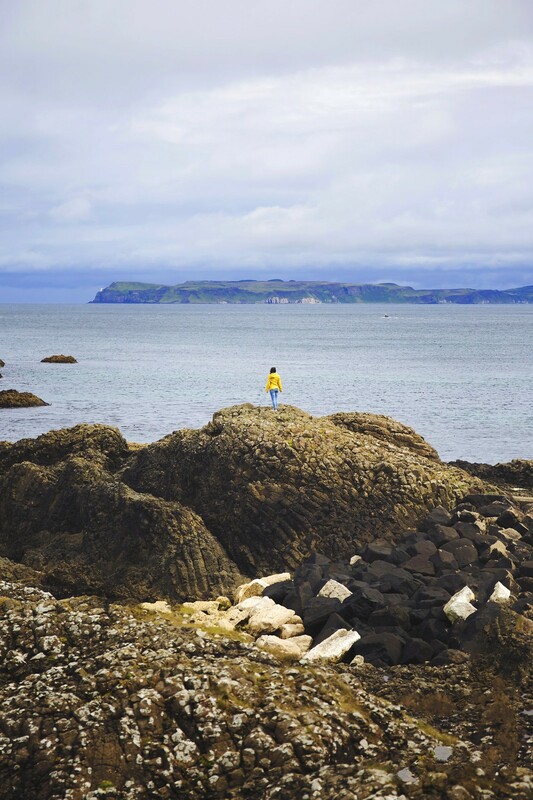 On our road trip around Northern Ireland, we spent the majority of our time driving along the coast. 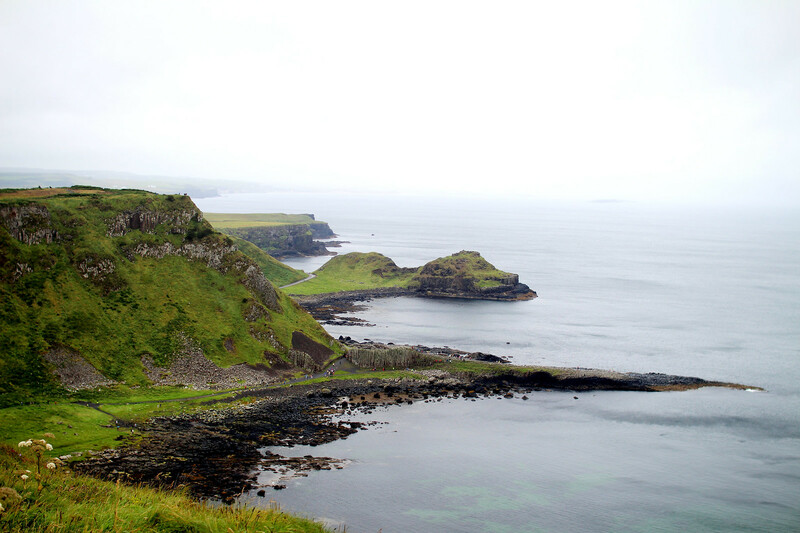 Home to world famous attractions such as the Bushmills Distillery, and of course, the mystical Giants Causeway. 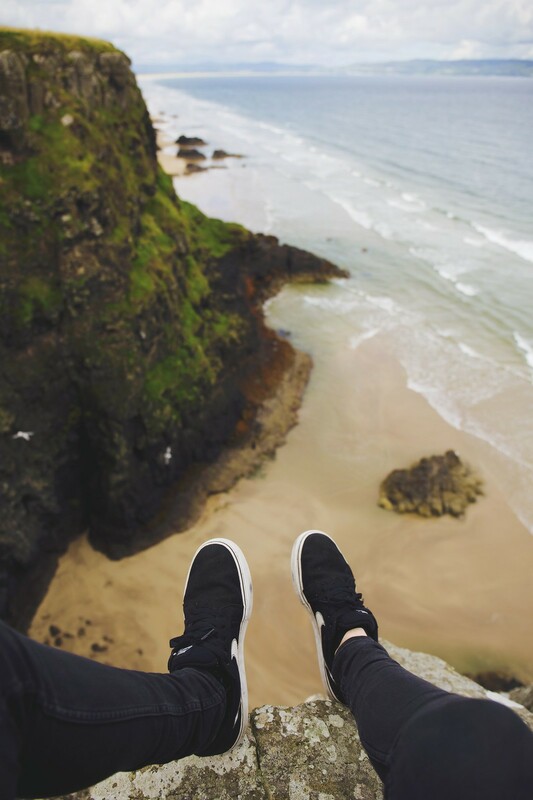 Welcome to the Causeway Coast. Out of every coastal stop we visited, this has to be my favourite. 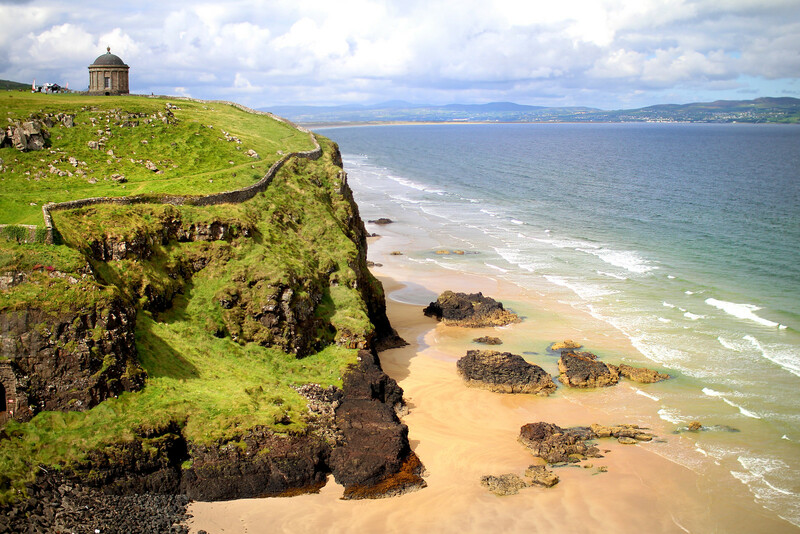 A friend from Northern Ireland had suggested Downhill Beach to us, and said nothing more. We had Google maps up eagerly trying to find our way there, to be directed through a winding caravan park. After several ‘are you sure this is where we are going?’ questions, we parked up and waited for the torrential rain to stop. Naturally it was gorgeous blue skies prior to this very moment, such is the ever changing weather of Northern Ireland. We gave it ten minutes and the rain started to lift, so we began to climb. After a short walk to the top of the cliff, we were treated to the most amazing views across the beach and beyond the coast. 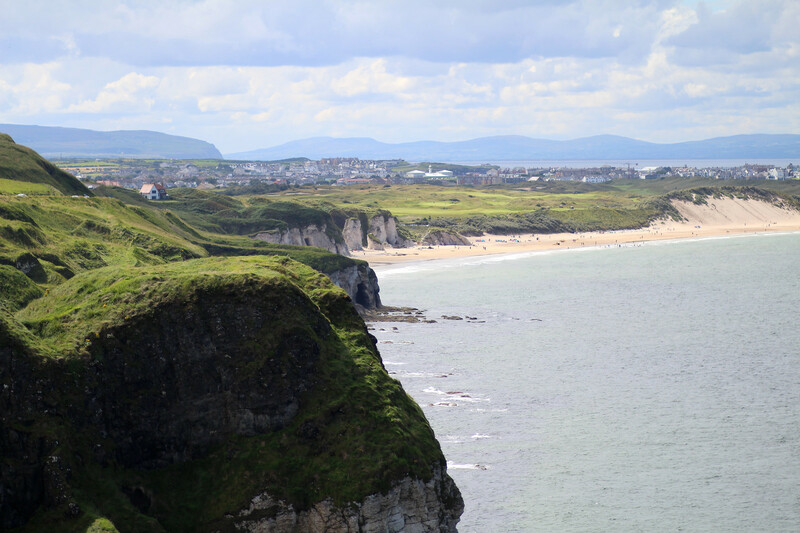 Overlooking to Mussenden Temple on the hill, and a very steep drop below. 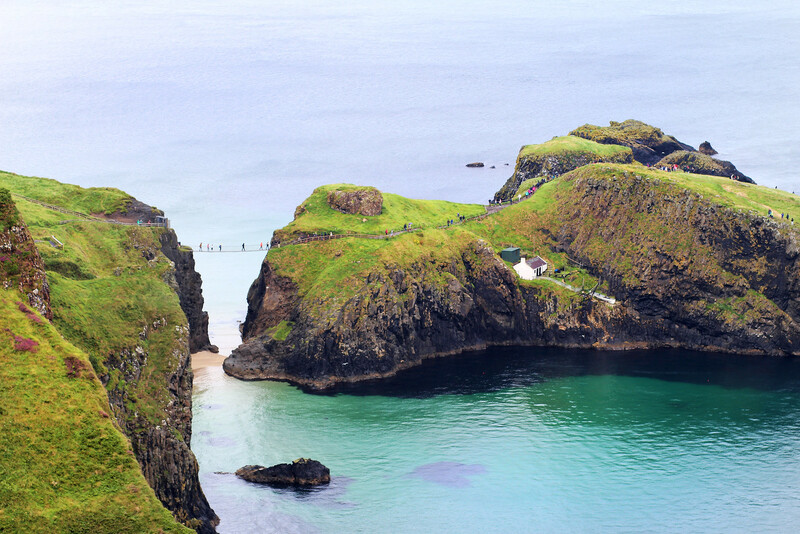 Just a short drive across from Giants Causeway, you’ll find Carrick-a-Rede rope bridge. It’s a National Trust site so there is a small crossing fee, but you are also able to go right up to the bridge and enjoy the views without paying. Made popular in recent times as the battle sight for one of the Game of Thrones episodes, there’s no shortage of visitors here. We were told it would be another two hour wait until we were able to cross the (albeit, small) bridge, so decided to do the walk instead and move on to our next destination. The walk to the bridge itself takes an hour, especially with stopping to take in the views. Although we didn’t cross the views ourselves, I personally felt the views of the bridge in the distance was better than what I expect you’d see on the island. Drive slightly along the coast towards the Portaneevy car park viewpoint to get the best view across the water, almost totally interrupted from tourists! It’s from here you’ll also be able to see across to the Scottish island of Islay. 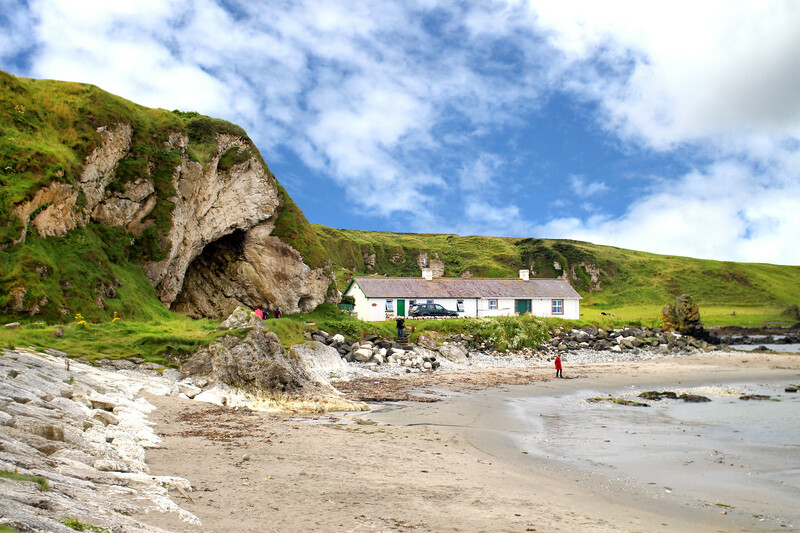 Another famous Game of Thrones landmark, Ballintoy Harbour is home to the Iron Islands. 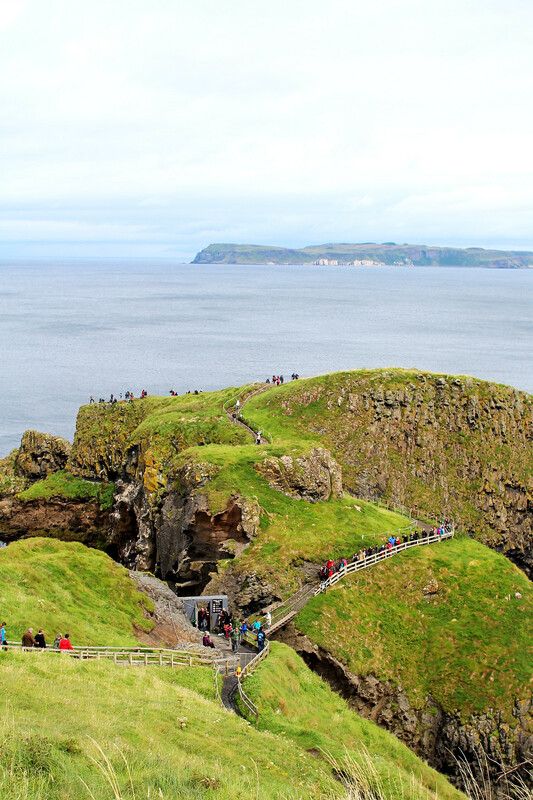 As big Game of Thrones fans ourselves, we couldn’t help but stand dramatically for photographs overlooking the ‘islands’. Not to mention, the beautiful coastal scenery surrounding us. There are also a few small tourist shops and a cafe at the harbour, should you want a snack or small meal en route. Beware that the drive down to the harbour is very tight and winding, an isn’t suitable for anything other than a car. 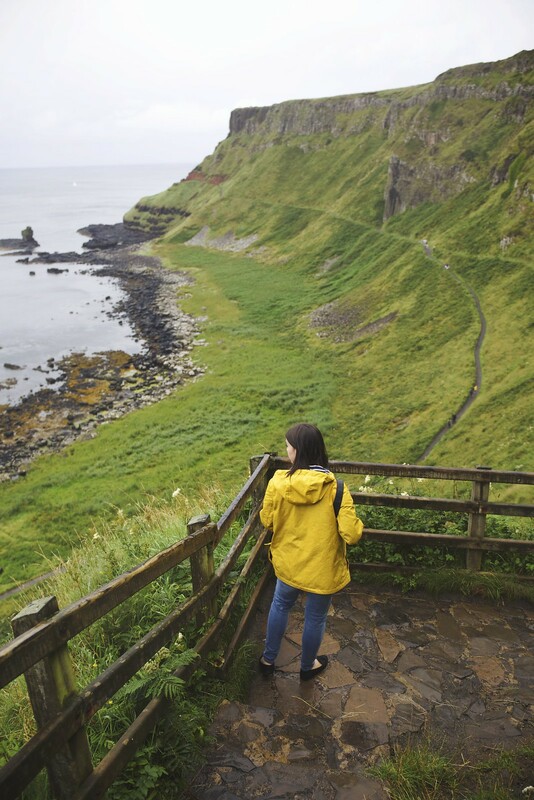 As one of the biggest tourist attractions in Northern Ireland, it’s of no surprise that Giants Causeway is on the Causeway Coast route. If you want to beat the crowds be prepared to go early, however it will be busy at all times of day regardless. 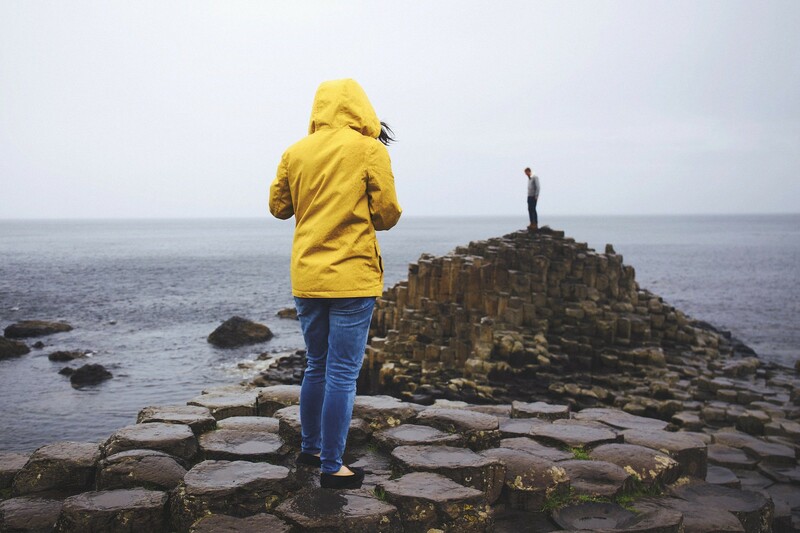 Read my post on visiting the Giants Causeway and what to expect, as well as how you can see it for free. Be prepared with proper walking shoes and a waterproof jacket. Learn from my mistakes and don’t wear inappropriate footwear, there’s a lot more climbing than you’d expect. 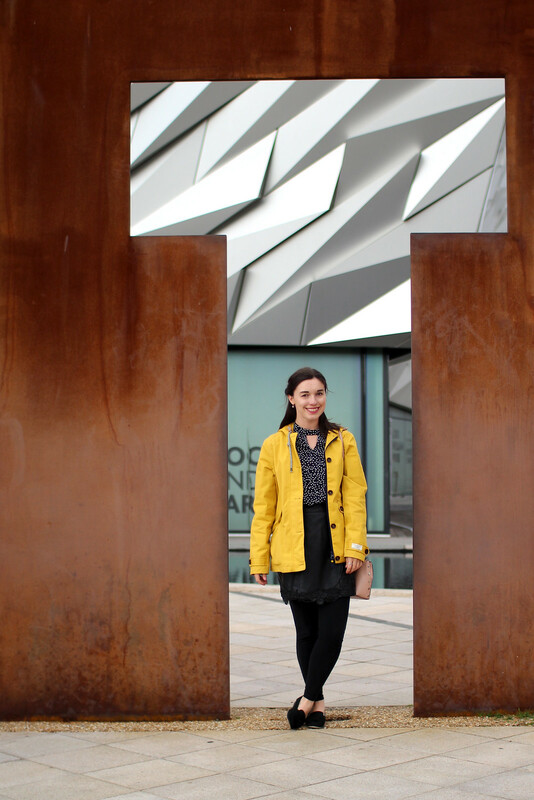 After one of the wettest days of my life on the Giants Causeway, I’ve never been so thankful for my rain coat! 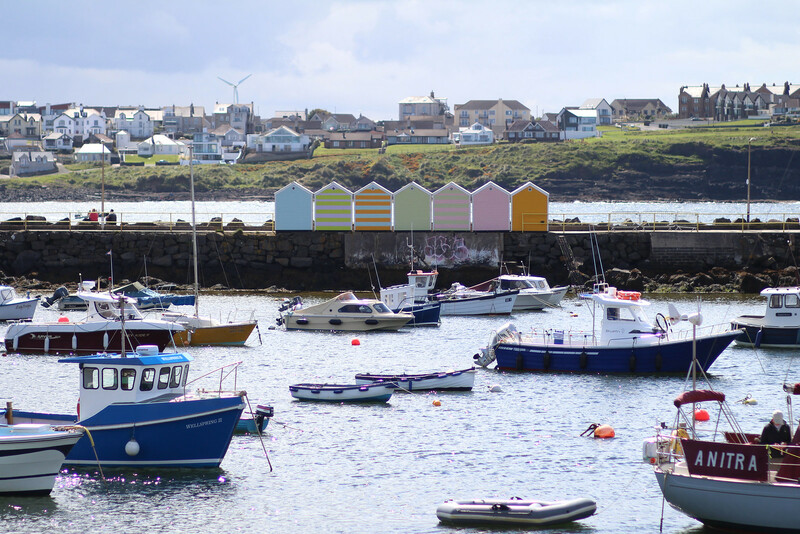 Two small seaside towns, Port Rush and Port Stewart are both picture perfect. 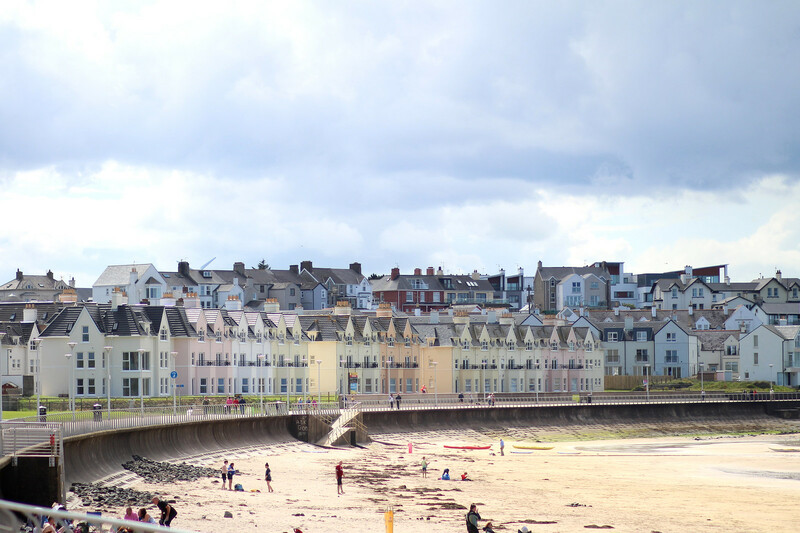 Be sure to stop at renowned Morelli’s for your ice cream fix, as you walk along the beach. Watch the waves roll in along the water as you pass the pretty pastel houses admiring the view. Both Port Rush and Port Stewart are great stops for some incredibly fresh food by the sea on your journey along the coast. 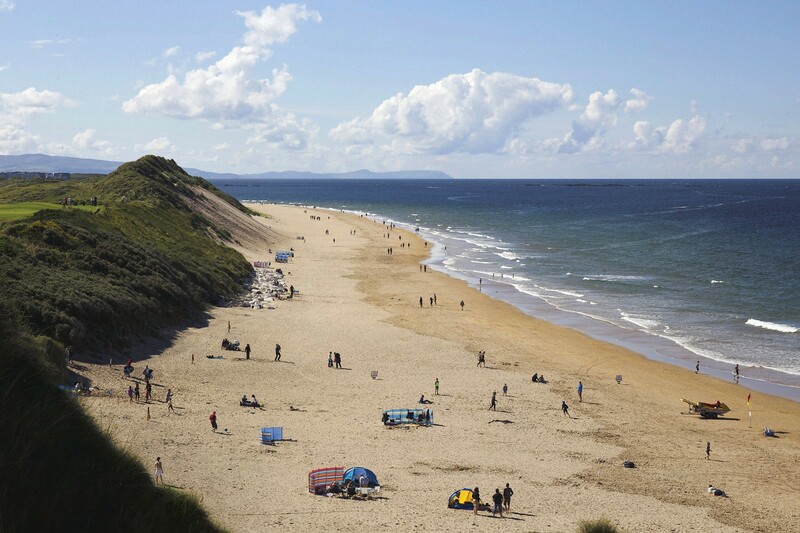 Just a short drive along from the main town centre of Portrush, you’ll find Whiterocks beach. A wonderfully tranquil spot, perfect for taking a breather after a days exploring. 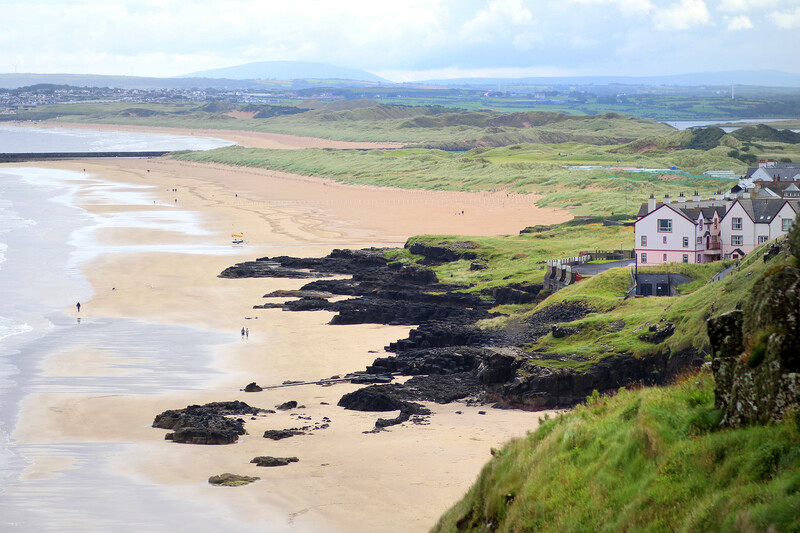 It enjoys stunning natural views from it’s coastal location, stretching from Curran Strand to Dunluce Castle. 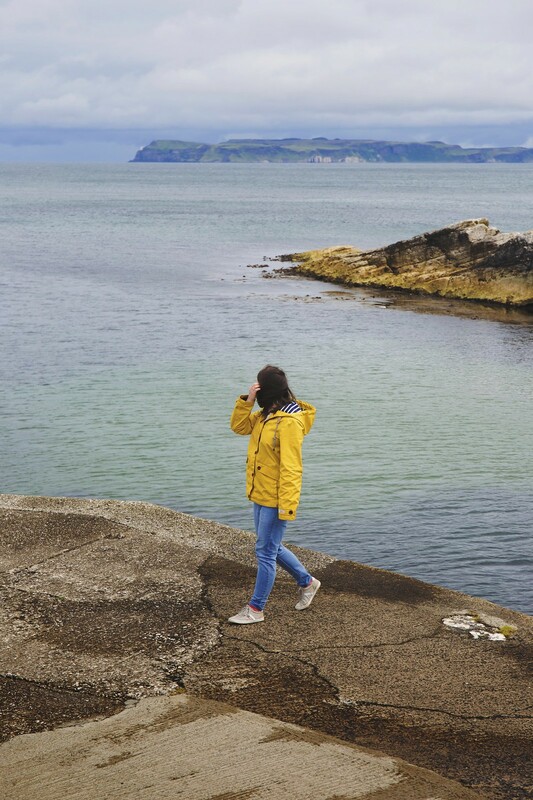 You’ll find a pull in area and car park at Magheracross where you can take incredible views towards the Giant’s Causeway and back to Portrush and Donegal. 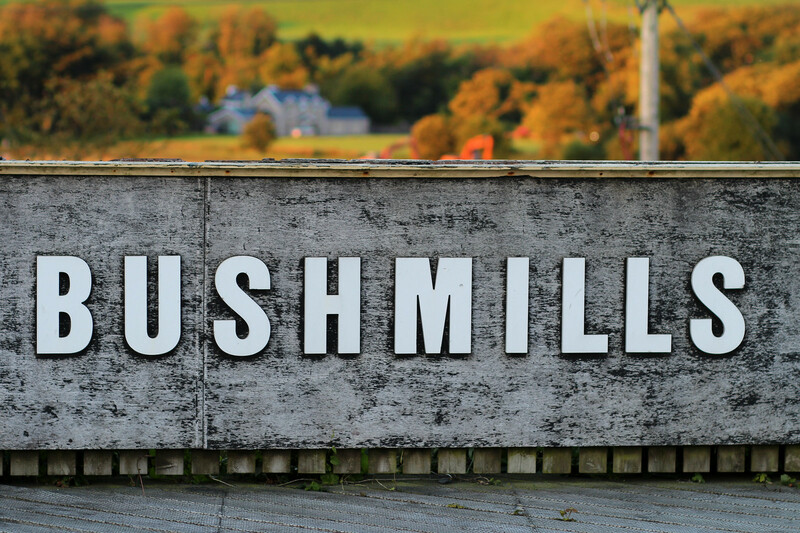 Home to the oldest whiskey distillery in the world, its no surprise Bushmills is a popular destination. We stayed the night in Bushmills village, giving ourselves time to explore more than just the distillery. 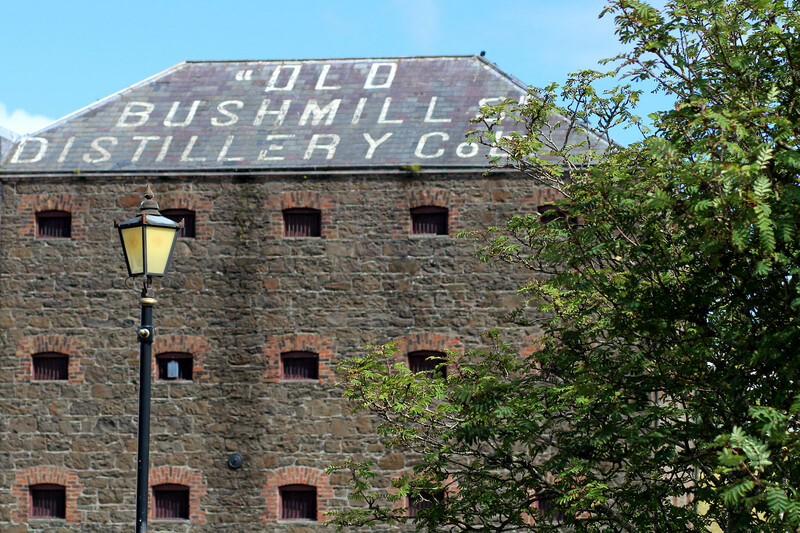 Our apartment was ideally placed in the centre of the village, which allowed us to fully appreciate the Old Bushmills Distillery tour. To then walk (stagger) our way back to the apartment for the night! The village is home to some quaint shops and pubs, perfect for a bite to eat. 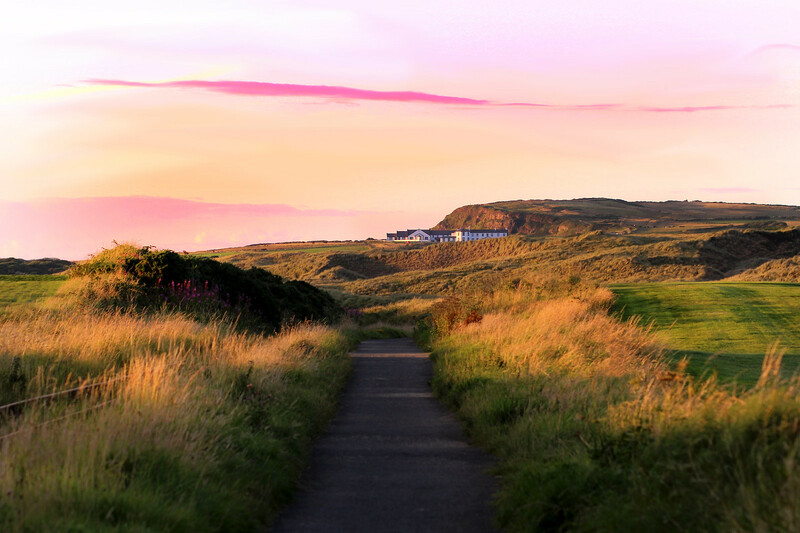 You can also walk along the Bushmills railway line towards the Giants Causeway, only a few miles down the road, for the most beautiful sunset. 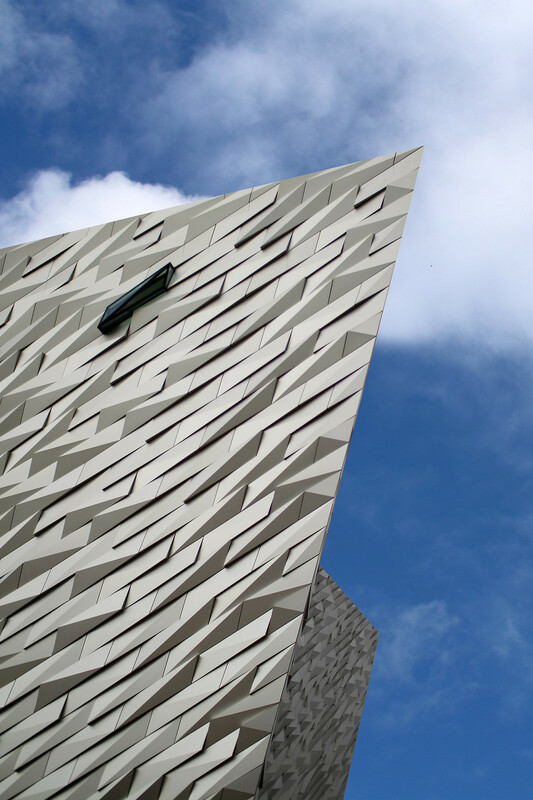 The capital of Northern Ireland, and the birthplace of the Titanic, Belfast is the biggest stop off along the Causeway Coast. It’s here we both started and ended our journey around the Causeway Coast, with one week in-between. 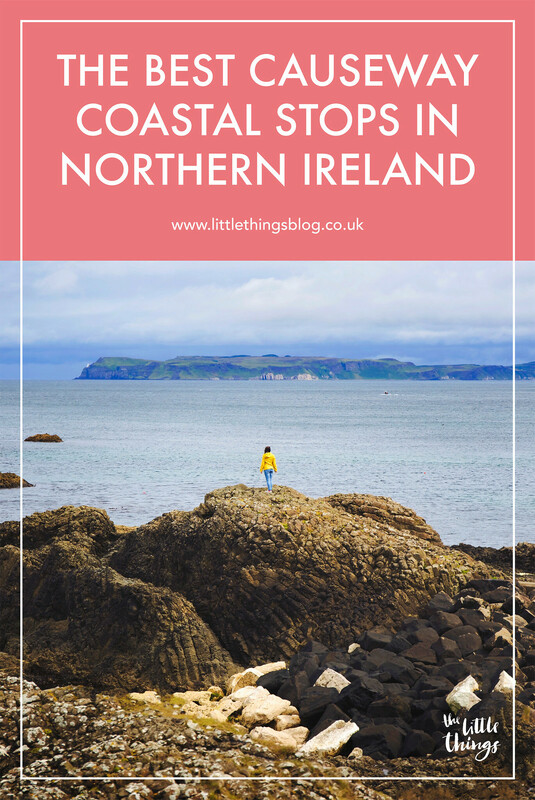 Northern Ireland is much smaller than you’d expect, and we didn’t even use more than one tank of petrol per car for the entire journey. 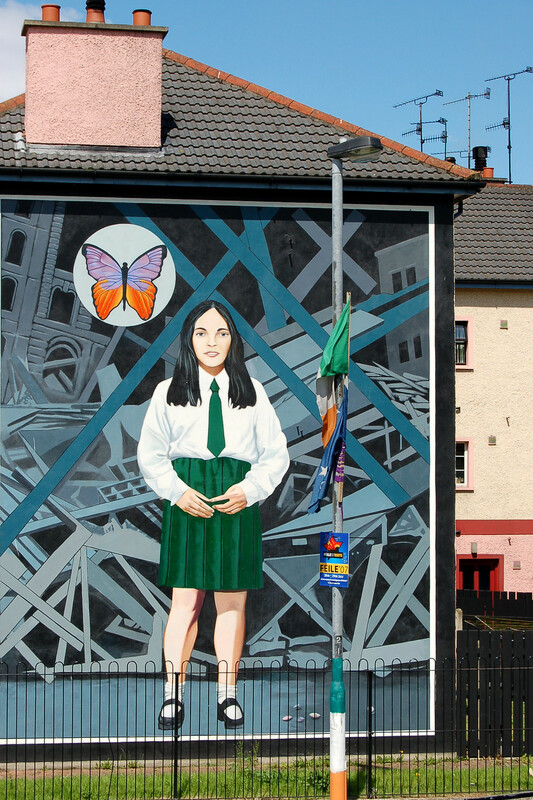 Being a city, there are lots of things to do in Belfast that aren’t just coastal views. 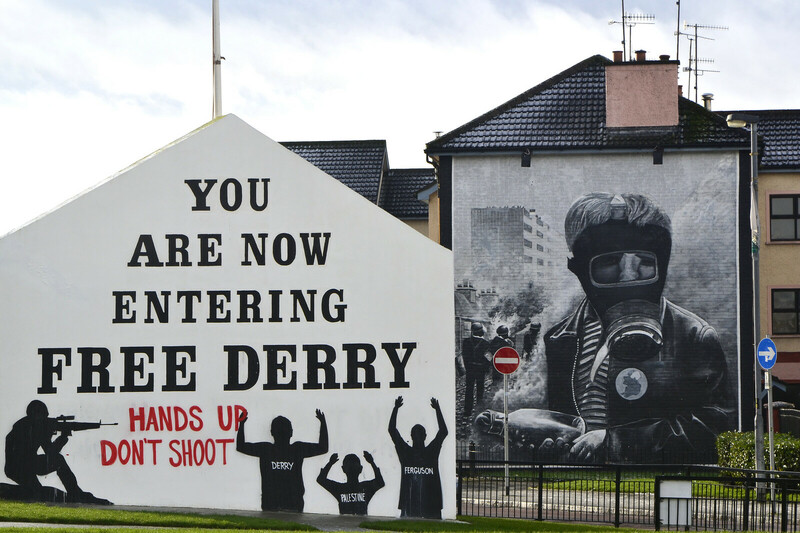 Educate yourselves on The Troubles on a taxi tour, dance the night away in the Filthy Quarter, or visit the home of the Titanic itself. 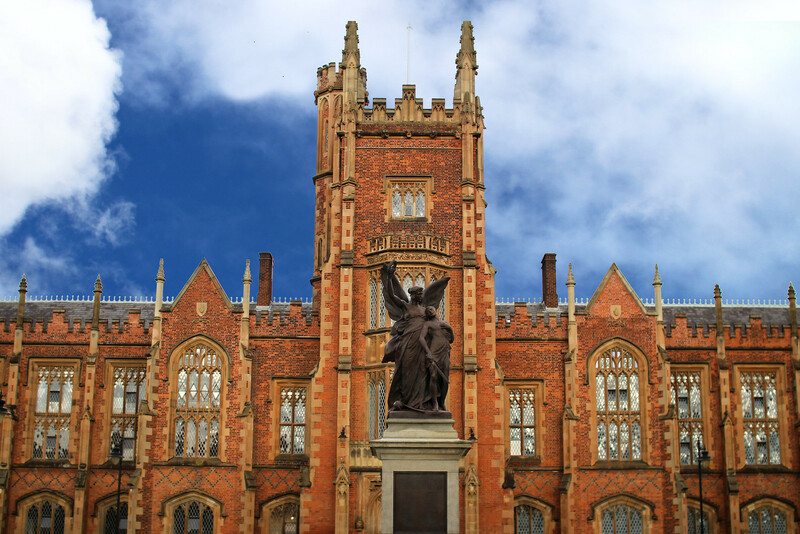 Read more about how to experience Belfast in 48 Hours in my round up post. 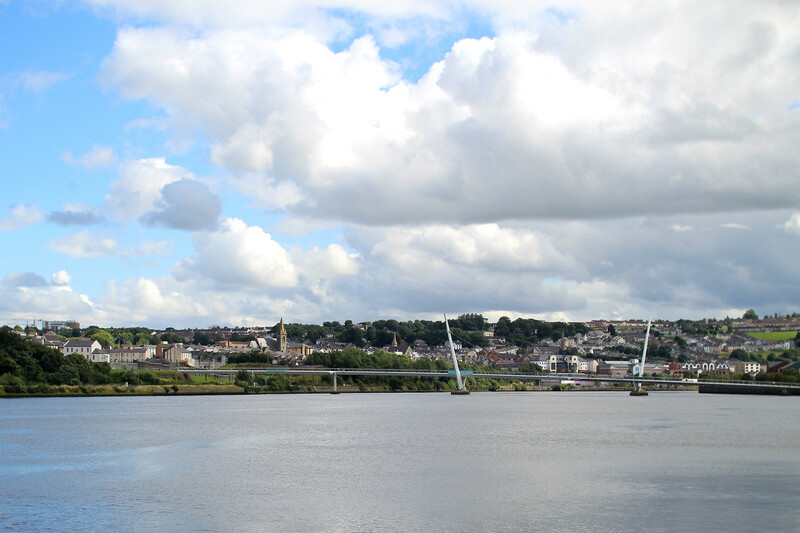 Another major city along the Causeway Coast, Londonderry feels very much like Belfast, but on a smaller scale. We stayed just the one night here, which was long enough for us to see Londonderry in 24 hours. 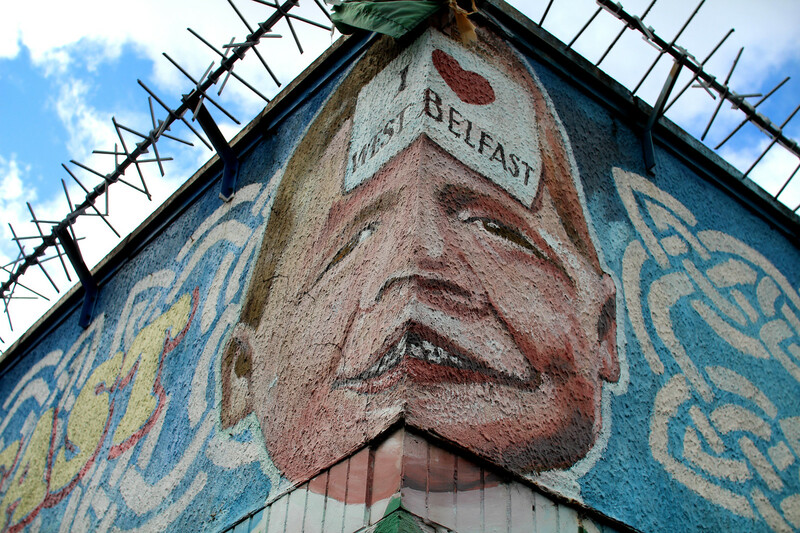 Allowing us to see the murals, walk along the city walls and enjoy live music in one of the many local pubs. I hope this gives you inspiration for visiting the Causeway Coast. Which are your favourite stops?